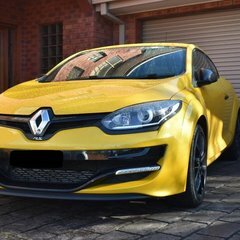 Over the weekend I signed the contract to purchase a 2016 Renault Megane RS275 Cup in Liquid Yellow from a Renault dealership. Today, in an attempt to insure the car before I pick it up on Friday, ran into some trouble. First of all, there is no option on RACV for a 2016 RS275 Cup... only a 2016 RS275 Cup Premium, or a 2016 RS275 Trophy. As an admirer or the Megane, I am sure it is neither of these. 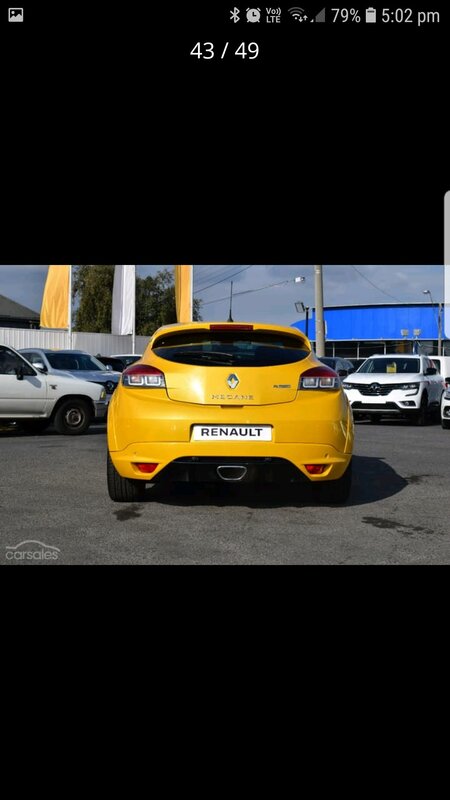 To further perplex this dilemma, when I called RACV to sort this out, and provided the consultant with the VIN number, he assured me that the car associated with this VIN number was a 2016 Renault Megane RS275 Trophy. Once again, the car I saw definitely was not a trophy. 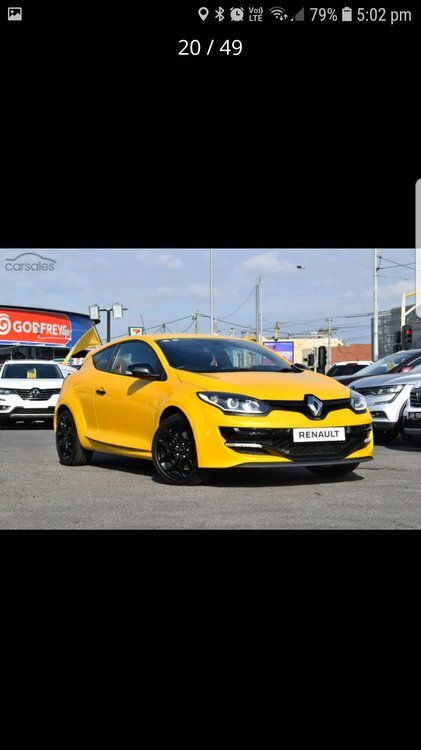 The car I purchased does not have Alacantara recaros, Akrapovich exhaust, any trophy decals, and the door trim says "Renault Sport" not Trophy. It also has a black front bar, not a Silver front bar as the trophy's have, with Trophy on it. 1) Does anyone have a 2016 RS275 Cup insured with RACV? 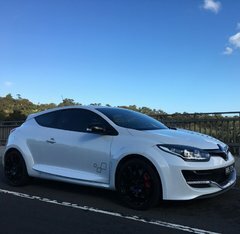 Below are a few photos of the car. I'm pretty sure this is a 275 Cup. I can't remember where I got this information from but I think the last lot of cup variants got the higher powered engine to run the model out. Redbook probably doesn't have anything like that listed, nor do any other databases. It should be fine but basically it is the base model, with a 275 engine. Insurance company databases are never accurate. They probably all use the same data. My 225 Cup 5 door is insured as a 225 F1 3 door hatch because they didn't have a listing for the 5 door Cup hatch. When I went to get a competitive quote last week with a different company, they had the same issue. The only problem with insurance is when you go to make a claim, then these trivialities turn into nightmares. Perhaps find a Renault brochure showing the specifications of your exact model, and show it to the insurance company. 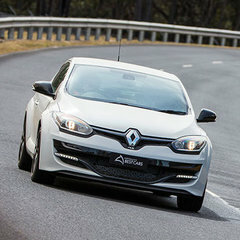 I found this on redbook: https://www.redbook.com.au/cars/details/2016-renault-megane-rs-275-cup-manual/SPOT-ITM-447298/ proves it exists basically? My biggest worry is insuring it as a Trophy - as stated by the VIN, and having issues if I were to ever make a claim. Thanks for your input - I'm not sure how insurance companies can do this.. but my biggest worry is the VIN! It's listed as a Trophy through it's VIN number. You'd just have to get in writing what they'll do... I've had chats with Shannon's about these kinds of things and they're happy to email me what they say so I've got it in writing. You don't want a trophy+ by any chance? FWIW it’s probably better for you to have a Cup insured as a Trophy than the other way around, especially in the event of a theft or other total loss. Is this the build date or compliance date? It might be a 2015 build. Excellent, so it's not that then! 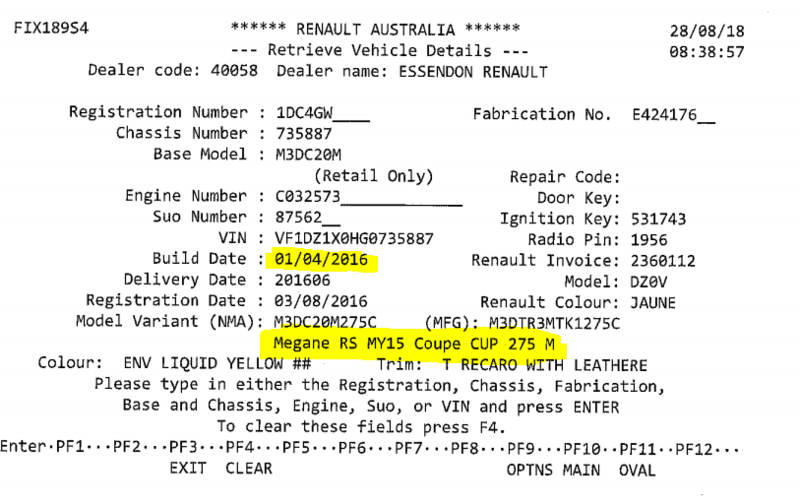 So an update: I spoke with Renault this morning who sent me the datasheet as per Renault Aus on this VIN (a snippet of which I've attached above).. and it's come back as a 275Cup... it's the database that RACV (and likely other insurance companies) are working off that is incorrect. Sent that datasheet to RACV now waiting on a response. Which is no good because I'm an impatient human being. IANAL etc, but I reckon all you need to do is provide them with the VIN and get the insurance sorted. If their own internal database information is incorrect about the model of the car, that's their problem. That's true - but they now know that it is the incorrect car and that could bite me later. I don't think I'll do it until I have a confirmation from them in writing stating they understand etc. I just hope it is done soon so I can have some peace of mind and pick up the car on Friday..
You're providing them with the correct VIN number that's all you're required to do. Let them know in writing that the wrong model is associated with the VIN and you have made all the necessary disclosures. My guess is that the dealer selected the wrong model when the car was first registered, so Vic Roads has the wrong info. I recently changed rego on a QLD car and the engine number was some random barcode on the block. the engine number was some random barcode on the block. tez275 I don't want to offend you though your vehicle is a 265 Cup. Is that what RACV was saying with your VIN? Visibly your car has the 18inch Tibor black wheels, no Akrapovic Exhaust (visible as no carbon fibre exhaust tip) and a black front grill blade. Interior wise I bet it has that black overly sized gear knob, cloth seats and a leather steering wheel. If so your vehicle is a 265 Cup. Not sure what is going on with Renault dealers though a lot of them have been advertising their 265 Cups as 275 Cup premiums. Perhaps it's a way of getting more for the car, I'm not sure. However the 265 Cup is still an awesome car and only a track really exposes the differences between the two. It's just shocking that dealers don't even know what they are selling. Hmmm... 2016 build 265 Cup? I'm not sure you're correct... Sports mode also shows max power of 275bhp? That might settle it? Also - all those extras you mentioned are for a Cup Premium right? I've got a Cup - so don't expect the akra exhaust, leather seats etc. Those aren't extras, those are the differences between a 275 and a 265. All 275's have the akra exhaust, suede Recaros and suede steering wheel regardless of whether it's a Cup Premium or a Trophy. I'm not sure you're correct - I am fairly sure (from previous research) that the cups don't have any of that. I am yet to see a 275 cup with alacantara recaros, suede steering wheel or an akra exhaust. Link above is carsales 275 cups. Link below is redbook. Can anyone else clarify this? Wow! I was always under the impression the only way to get a 275 was either in Trophy, Trophy-R or Cup Premium form. Never new we received a 'Cup' version. I know, it's confused a lot of people. @chuckovski stated earlier in this thread that he believes they are basically a 265 cup with a 275 engine to run out the model. I've just purchased what i believe to be the same model. Have not picked it up yet. With the silver tip exhaust, does this mean I won't get the crackles and pops? Hi ak275, I have just purchased a 2014 265 Cup Premium. 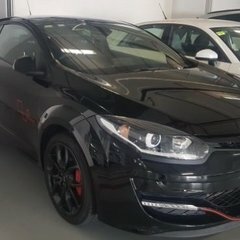 I actually rang Renault Australia a couple of days ago, gave them my VIN number and that’s the model variant that they told me I have. 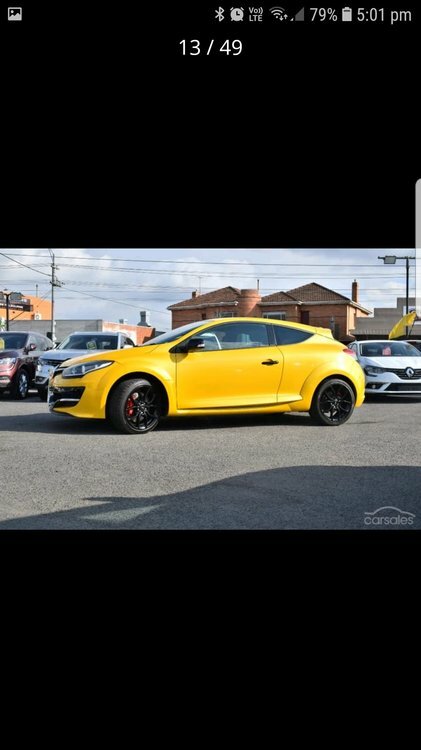 After reading your post though I’m confused as my car does not have the Akro exhaust, it has 18 inch black Tibor rims, cloth seats, leather steering wheel, basically all the things that you are saying would make it a Cup model not a Cup Premium but as I said when I gave Renault Australia my VIN they told me it’s a Cup Premium???? Ahh I see, thanks for clearing that up. its like I’ve got a bit of a bitser, cause it’s missing the Recaro seats, 19inch rims etc but it does have keyless entry, RS Monitor 2.0... were these things that were supposed to be only for a Premium variant?? I’m unsure as I’m very new to Renault’s..
No they came standard with the facelift 265 cup. Does yours have reversing camera? IIRC that's another difference. Its a cup. Good car, enjoy. Just hope you didnt pay a premium for it that you shouldnt have..
Hey RedMist, I think the price was pretty fair being that it was from a dealership where you generally pay a bit more but I guess you have a little more piece of mind for that higher price too.